Leona Lewis was born and brought up in Islington, a part of the British capital London. Although the young singer is only 22 years old, she can boast of several achievements. Leona liked singing since childhood. At the age of 13 she won at a talent competition for teens for the first time. Later Leona had singing lessons with professional pedagogues and studied at the British School For The Performing Arts and Technology. Katie Melua graduated from the same institution. Leona did not have a needed sum for album recording and she had to try several jobs (like a pizza waitress) in order to get money for studio work. Once she even found a good producer, but lost her faith in success. Luckily, Miss Lewis' boyfriend made her go for the X Factor audition. After that Leona started a new period in her musical career. She enchanted the judges by the opportunities of her voice, covering A Moment Like This that had become a hit in Kelly Clarkson's interpretation. There is nothing shocking in the fact that the young soul-diva Lewis won the 2006 episode of the show. This year she released her debut album called Spirit. One of the X Factor judges Simon Cowell and Clive Davis took the part of producing the disc. Spirit became an undoubtedly strong and assured debut of the artist. Maybe it is due to Leona's studio work experience, though her previous disc never saw light. Maybe it is due to the celebrity producer staff, which will be talked about further. But the major role was played by the young artist's bright talent. Lewis, resembling young Whitney Houston by her singing manner, makes some incredible tricks with her coloratura soprano in both a rhythmical soul ballad Angel and a dancing R&B composition Whatever It Takes. While on the cover for the Avril Lavigne's song with minor popularity I Will Be Leona's voice reaches almost the whistling register. One more cover Homeless is a violin-driven low tempo and wonderfully lyrical composition, decorating the album with the artistic performance. It proves once again that Lewis is a talented actress. Take A Bow starts with a cold synthesizer riffs, but it later amuses the listeners with the powerful and melodic chorus. A sentimental and touching thing I'm You, decorated with the harp play, features Ne-Yo on back vocals. 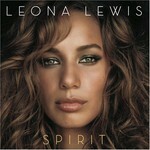 Though the most striking and unforgettable track on the album Spirit is its lead single Bleeding Love. It fascinated the British listeners by beauty and sound freshness. It is an interesting thing that after the victory at the contest Leona Lewis did not become a victim to the star disease. For example, she is still dating with the same boyfriend that once made her visit the audition for the X Factor. Leona plans to marry him. Nevertheless, the winner of the talent competition managed to estimate precisely all the opportunities she got and decided to record her debut disc with the best producers and only in the best record studios of the world. That is why the work over Spirit at first was started in her home city, and later the singer moved to the U.S.A., where Leona teamed over the material with many persons in Los Angeles, Atlanta, and Miami. Besides already mentioned Simon Cowell and Clive Davis, such names as Walter Afanasieff (co-worked with Celine Dion), Dr. Luke, Eric Hudson, Jam, The Runaways, Stargate and some others put their hands to this edition. There is nothing strange in the fact that this debut disc has such a huge potential - at least 50 per cent of the songs deserve to become hits, adored by people all over the world. The only thing that makes this brilliant debut not so shiny is the tonsillitis that Leona Lewis overcame a short time ago - the illness became the reason for delayed Spirit release and made the artist cancel the performance in the U.S.